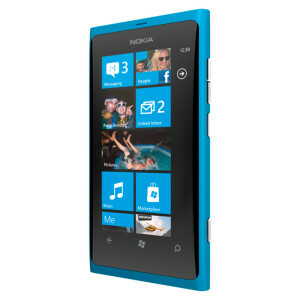 The wait for the first Windows Phone from Nokia ended with the release of Nokia Lumia 800, a gorgeous smartphone. Nokia used the design of N9 with the Windows Phone mango software to make what we see here as the Nokia Lumia 800. 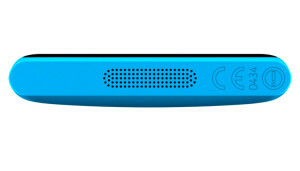 Within just six months the company made this phone so as to give competition to the other giants in the market. 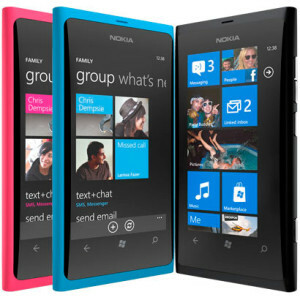 Available in black, cyan and magenta, the Nokia Lumia 800 has a curved 3.7 inch glass AMOLED display that gets smoothly with the unibody design. The phone doesn’t have a front facing camera and the notification LED like the other smartphones. Though the screen size is a whooping 3.7 inch, the actual display is slightly smaller due to the intrusion of Windows Phone buttons. The sound output is impressive, as is the video playback. However, the 8MP camera in the phone isn’t the best and captures average images only. The phone’s smooth functioning is due to the 1.4 GHz processor and 512 MB RAM. Lumia 800 has as onboard memory of measly 16GB and it doesn’t support a memory card for expanding memory like that of N9. The Windows operated phones have performed very smoothly like that of Android & iOS counterparts instead of having a slightly inferior hardware. 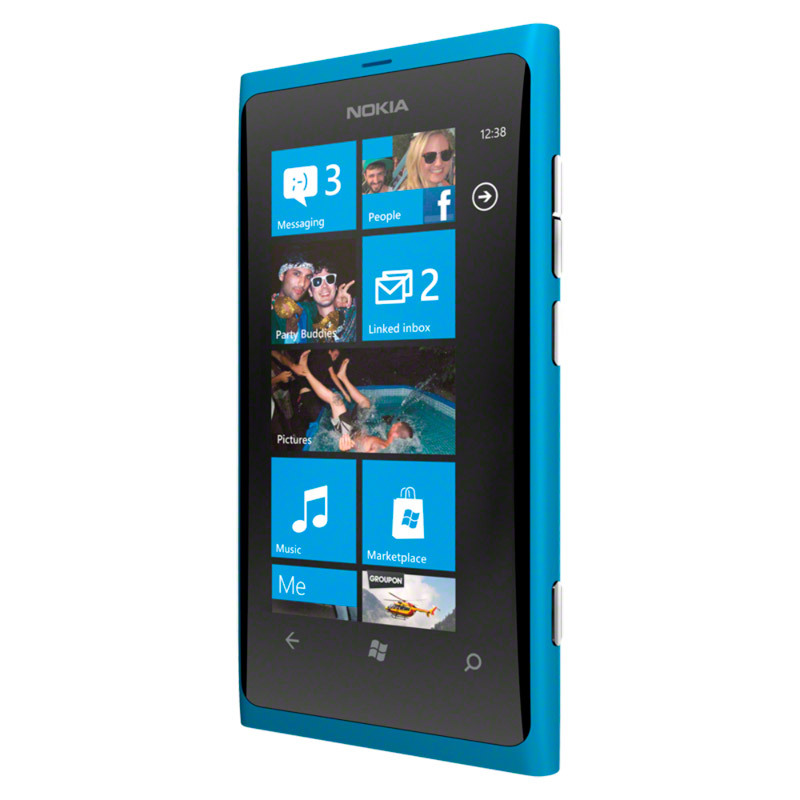 The Lumia 800 is no different in this respect. All actions on the device perform at blistering speed and multitasking is a breeze with Mango’s new webOS like app switching. The Nokia Lumia 800 is packed with Qualcomm MSM8255 single-core processor which also powers the HTC Titan. 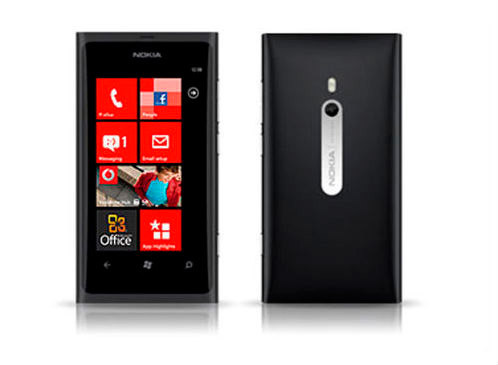 Nokia adopts their Clear Black AMOLED technology for the Lumia 800’s 3.7-inch display. 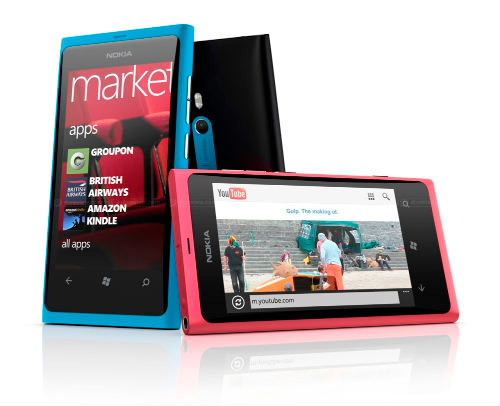 It is of the same type as on the N9, with the only variance being in the screen size and resolution. As mentioned above due to Windows Phone hardware cap, Nokia could only implement a WVGA 800×480 panel, but nonetheless it is a stunning panel. 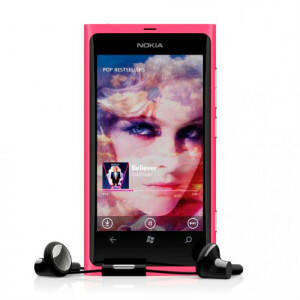 Nokia is one company which has always produced stunning camera phones. Nokia’s N8, last year’s flagship, was lambasted from all quarters but the one thing it had going for it was its 12-megapixel camera. It was so good that till date its camera is considered the best ever in a mobile phone. The Lumia boasts of all standard camera jargons, such as an f/2.2 aperture, high performance optics courtesy Carl Zeiss and zero shutter lag, but let’s get real – the 8 megapixel camera is no N8. Yes, it’s a very good camera phone but it’s not the best one in town by a long shot. 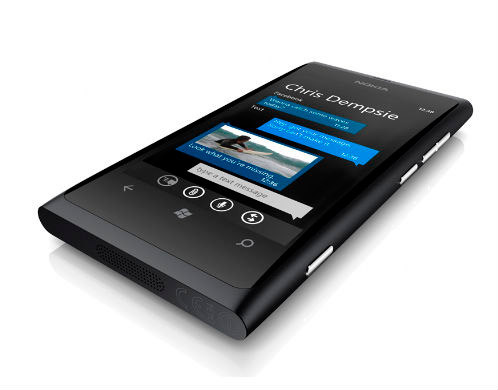 Nevertheless, in the Windows Phone ecosystem the Lumia 800 is the king of camera phones. 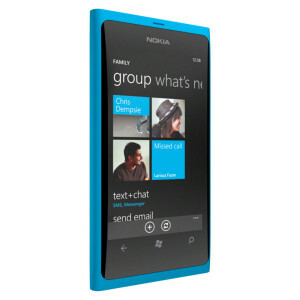 What really differentiates the Lumia 800 from the orphaned N9 is the software running under the hood. 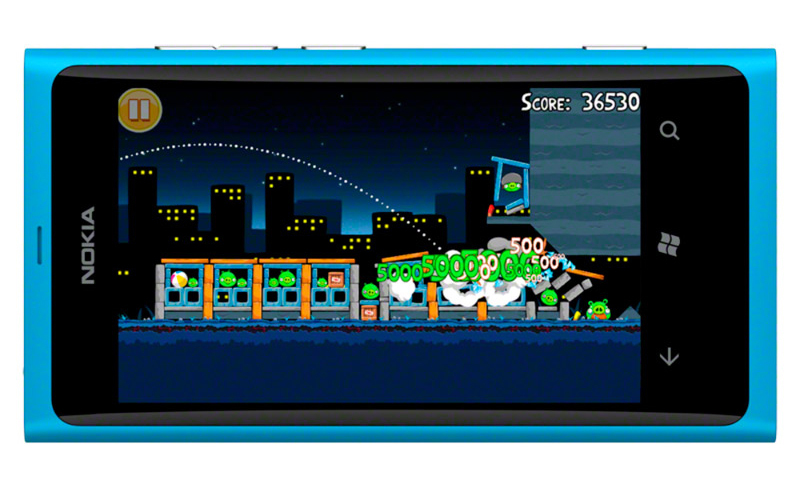 This Windows phone is equipped with a Metro UI. The customizable tiles on the homescreen with the app menu are similar to any other Windows Phone device. 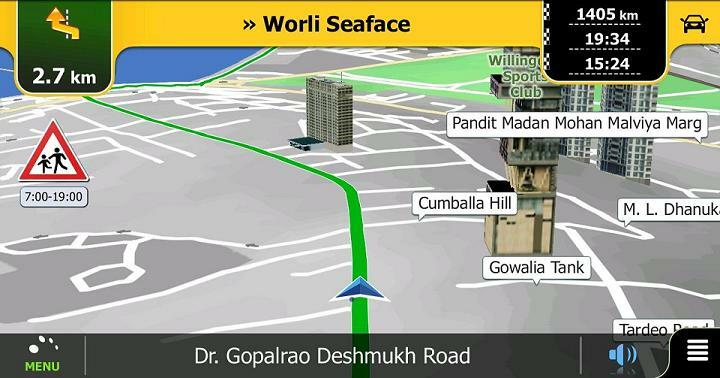 Onboard apps include Nokia Drive for navigation, App Highlights for recommended apps by Nokia, Nokia Maps, Bing Mas, Tunein Radio and Timespoynt to mention a few. Starting the phone prompts you for a Windows Live ID for downloading applications and SkyDrive for data storage and the Nokia account. Typing using the onscreen keyboard is a pleasing experience and all communication appear under a single hood. Although everything seems so impressive, the phone does have some drawbacks. The onboard memory of the smartphone is a measly 16GB and it doesn’t support a memory card for expanding memory. 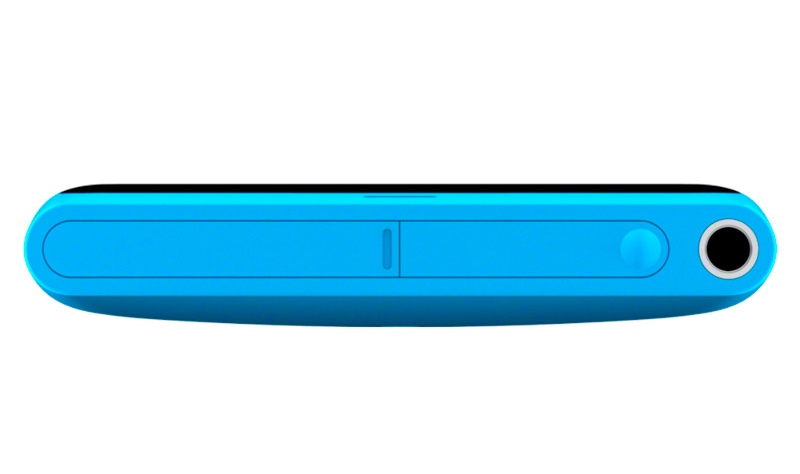 The applications available for a Windows Mango are very few in comparison to those for iOS and Android. Another drawback of the Windows Phone platform is one its inability to transfer content over Bluetooth. The battery backup too is just about average. NFC is also inexplicably lacking, so the phone can’t pair up with Nokia accessories and it probably won’t be able to keep up future innovations that Nokia says its working on its new phone, the Windows Apollo. Nokia Lumia 800 costs Rs 29,999 in India or approximately $666.64 in US currency and will be competing against other rivals like the Apple iPhone 4S, HTC Sensation XL, Sony Ericsson Xperia Arc S, Samsung Galaxy Nexus .